Go North East, represented by law firm Ward Hadaway, has won an important case against an improper personal injury claim. The case was heard at Sunderland County Court where a Judge ruled that, not only was a personal injury claim improper and should be dismissed, but that the claimant and his solicitors should pay Go North East’s costs. This is the second time this year that dishonest claimants have been caught out by Go North East, highlighting what the company sees as a growing problem with some personal injury solicitors who pursue claims they know to be improper. In September 2014, a Go North East bus had a minor collision with the partly open door of a parked van, causing superficial damage to the bus which the bus firm accepted liability for. A passenger on the bus claimed that he had been jolted backwards and forwards by the accident, and suffered a significant neck injury which resulted in him not being able to work for several months. However, CCTV footage showed that the passenger was standing, not seated as he had said, waiting to get off the bus, and was completely unaffected by the minor accident. The CCTV was disclosed to the passenger's lawyers with a request that they ask the medical expert to comment upon whether he could have suffered injury in light of what was shown, but they decided to issue proceedings despite the inconsistent evidence. The court documents said that the claimant was standing at the time of the accident. When a formal witness statement was disclosed, the passenger said that he could not remember if he was standing or seated. Eventually, the medical expert was shown the CCTV and agreed that there was no medical basis to support the allegation that the passenger was injured in the accident. The claim was then withdrawn. The Court ruled that the claimant was fundamentally dishonest and ordered the passenger to pay Go North East's costs. The Court found that the claimant's lawyers acted improperly or rather failed to act by not earlier sending the CCTV to the expert. 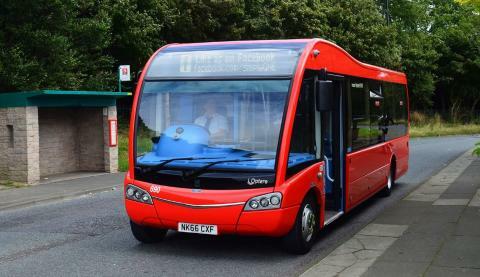 The claimant's lawyers were therefore also ordered to pay the bus firm’s costs. Go North East’s managing director, Kevin Carr, said: “We take a firm stance against anyone who attempts to obtain money from our company improperly. “There are no winners when it comes to dishonest compensation claims – ultimately we all pay for these through subsequent rises in transport fares, or in the case of private motorists, the cost of insurance." Paul Hughes, Consultant at Ward Hadaway, who advised Go North East on the case, said: “This is a welcome and refreshing decision. It is very unusual for solicitors to be ordered to pay costs in this way. This decision demonstrates that courts are becoming more robust in the challenge to improper claims not supported by evidence."